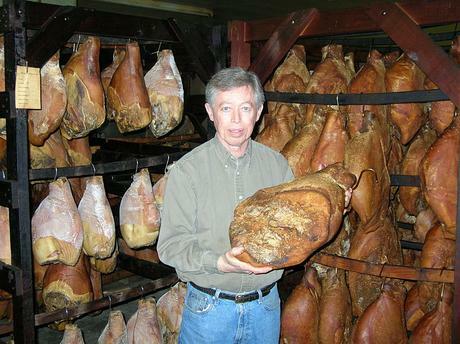 Allan Benton holding a hickory smoked country ham. Eating Allan Benton’s bacon is an intense experience. It’s salty, smoky, everything you expect in a good bacon, but more. While most industrially produced bacon is made in a matter of hours with chemicals and liquid smoke, Allan cures his pork bellies in a mixture of salt, sugar, and nitrite for a full month before smoking them over hickory for three to four days. It’s a much longer process than even other artisan bacon makers use, and the result is correspondingly bigger flavor. I met Allan back in May at Camp Bacon, an event that unites enthusiasts for a long weekend spent celebrating everything bacon. The day-long main event featured two bacon-laden meals, a dozen samples, and a handful of speakers who told stories of what hogs and bacon mean to them. Several of the speakers were folks who make traditional varieties, and each had a compelling story to tell. But to me, it was Allan that really stood out. His enthusiasm for making country ham and bacon, and for sharing those flavors with people who appreciate them, was contagious. Allan isn’t the big, burly man I expected; he’s maybe 5’8”, slender, kindly, with a twinkle in his light blue eyes. His passion surfaces when he speaks about his commitment to producing full-flavored, traditional hams and bacons. He uses the same recipes he grew up with on his homestead in the back country hills of western Virginia. On Thanksgiving, the family and community would get together, slaughter the hogs, and begin curing some of the meat while feasting on rest. The meats they cured each winter would provide food for the family for the coming year. 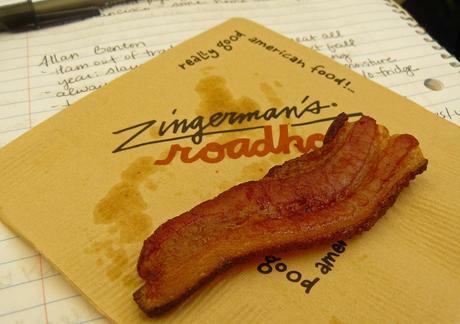 The author’s photo of Benton’s Bacon at Camp Bacon. Does knowing the history make Allan’s bacon taste better when I fry it up for breakfast? I’m not sure. But knowing the man who made it makes the experience more meaningful to me, and somehow that flavor comes through beneath the savory intensity. It’s kind of like eating grandma’s cookies, which have been made the same way for decades: with love. Val works for Zingerman’s Mail Order.